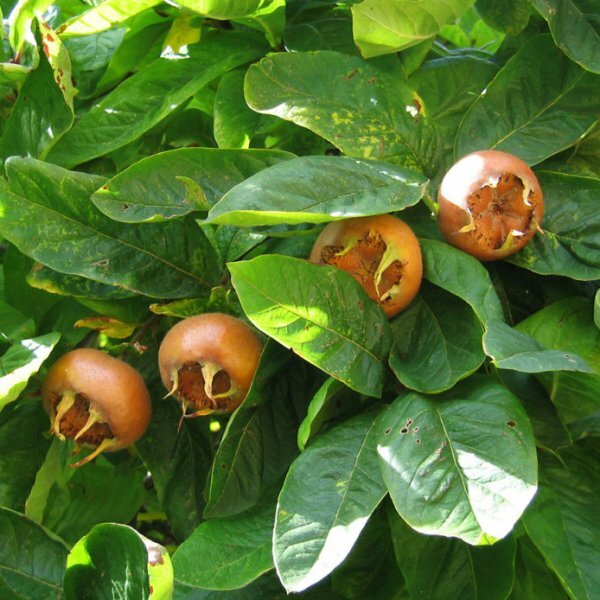 The common Medlar (Mespilus germanica) is a slow growing, large deciduous shrub or small tree growing up to 26 feet (8 m) tall. The leaves are dark green and 2 to 6 inches (6 to 15 cm) long and 1 to 1.5 inches (3 to 4 cm) wide. 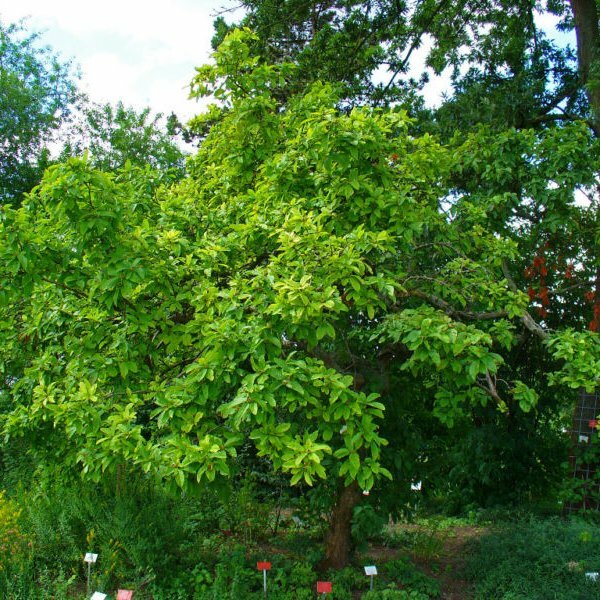 The leaves turn a spectacular red in the fall, and the plant has beautiful white flowers in late spring. The fruit is a pome, and is about 1 inch (3 cm) in diameter, with wide-spreading persistent sepals giving a “hollow” appearance to the fruit. Medlars are eaten very much the same way as persimmons. 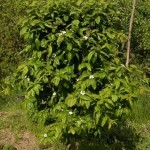 Initially the fruit are very hard and acidic, but they become edible after being softened (”bletted”) by frost, or naturally in storage given sufficient time. Once softening begins, the skin rapidly takes a wrinkled texture and turns dark brown, and the inside reduces to a consistency and flavour reminiscent of apple sauce. Medlars are hard to start froom seed. They are self-fertile so they don’t need another tree for pollination and they produce fruit by the second year. They are slow growing, like full sun, but need a temperate climate, well-drained soil, and shelter from any strong winds. They don’t like to dry out, but kept moist. So if you’re looking for something new, try a Medlar! Germination Seed - best sown in late autumn in a cold frame. The seed has a very hard and impermeable seedcoat, so to break it please follow the info below. 1. Soak the seed for 24 hours in very warm water then cold/moist stratify it for 3 months at +1 - +5C before sowing it. 2. Sow 2-4 mm deep. Requires light for germination, so germinate in warm and bright place. Long term germination - please be patient. When they are large enough to handle, prick the seedlings out into individual pots and grow them on in the cold frame for their first winter. Plant them out into their permanent positions in late spring or early summer, after the last expected frosts. Cuttings of mature wood, November in a cold frame. Poor percentage. Layering in autumn or early spring. Takes 18 months.